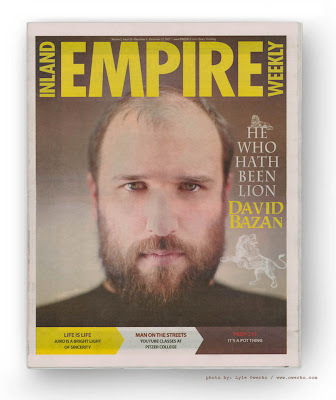 Recently shot a portrait of singer/songwriter David Bazan formerly of the band Pedro the Lion. His management sent me a copy of a newspaper that one of the portraits appeared on (which I attached above). If you have time check out David's music (he's signed to Barsuk Records - home of bands like Death Cab for Cutie, Nada Surf and They Might be Giants). David's a super sweet guy whose music reflects his sense of introspection and dedication to craft.